Damn - have limited myself to buying British steelbooks only (in order to prevent a credit card coma) - I would kill for any DC Animated UK released Steelbooks though!!! Hope the US release this as a steel as they have with The Dark Knight Returns. It's not a Steelbook, it's a MetalPack. is it dvd size or blu-ray size? What happened Warner? The previous 4 in the series were all SteelBooks. I've not received mine yet, but will have no choice to open the package when it arrives as The Croods SteelBook Lenticular has been shipped with it. 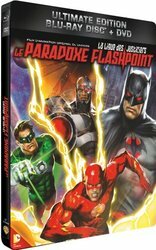 I will have to send back the MetalPak, but not before sending a piece of my mind to amazon.fr about it being a SteelBook in the description on the site. Glossy metalpak with metallic shine, which I've tried to show. Really smart. All images can be clicked on for a closer view. They are all high res and can be viewed at full scale. Below are shots to help show the finishing on the steel. got this courtesy of www.mov-style.fr and I'm very pleased with the purchase. Ordered one of these myself today, its not avilable in the UK on bluray, and im currently collecting DC Animated Movie steels/Metal packaging so this will be perfect.